Did you guys like the Lacquery post yesterday? Today I have part two! 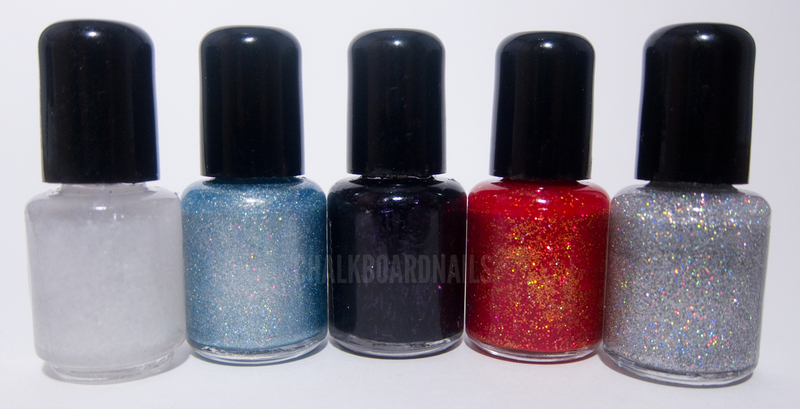 Here's the lineup again, get ready to see the first and third polishes today! First up is All of the Lights. 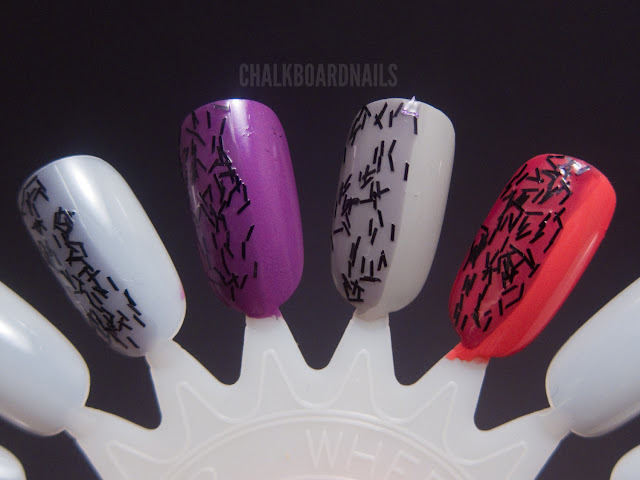 This polish is unlike anything else that I have seen before. Here's the description from Lacquery. Turn the lights off and watch it glow. 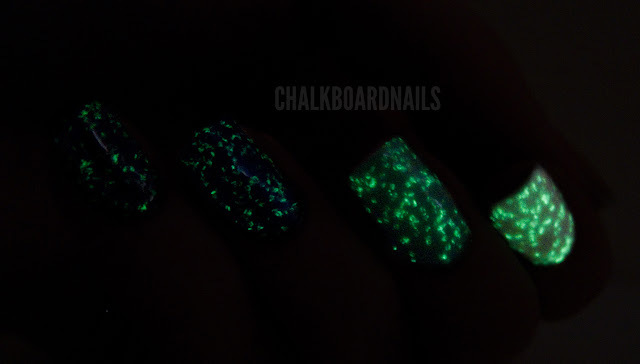 A fun glow in the dark top coat. ...BLAM! Glow in the dark GLITTER! Pretty cool huh? As with most glow in the dark things, it glows brightest over lighter colors. It didn't seem to hold the glow as well as China Glaze Ghoulish Glow, for example, but it wasn't too bad, either! It did require a bit of charging under a light for it to work well enough for me to photograph it. Finally, we have Slam. 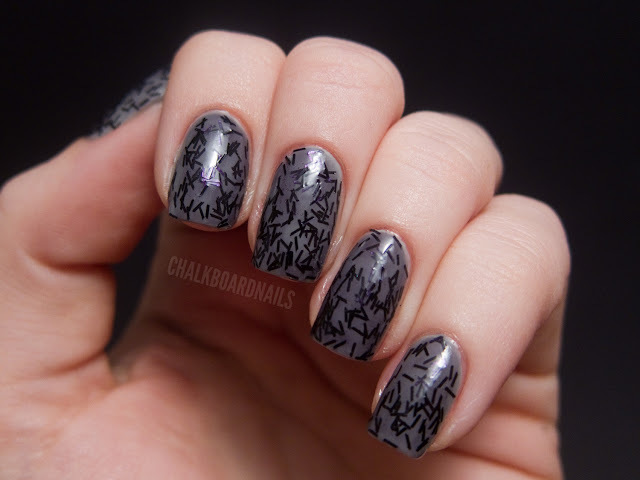 Slam is a black bar glitter polish in a sheer sheer grey jelly base. 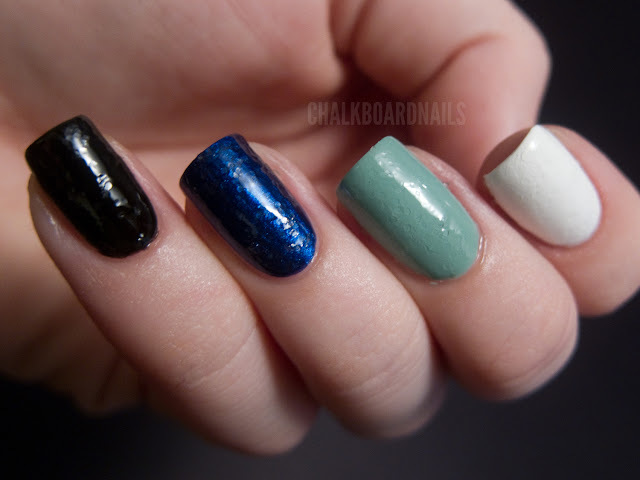 This newly reformulated polish, is a pure glitter polish filled with black shard-like glitter. This is a great stand alone polish, but looks excellent over a variety of other polishes. It is really cool, but tough to wrangle. This polish would be much easier to use without the tinted base. The problems arose when I was trying to spread the glitter around evenly. 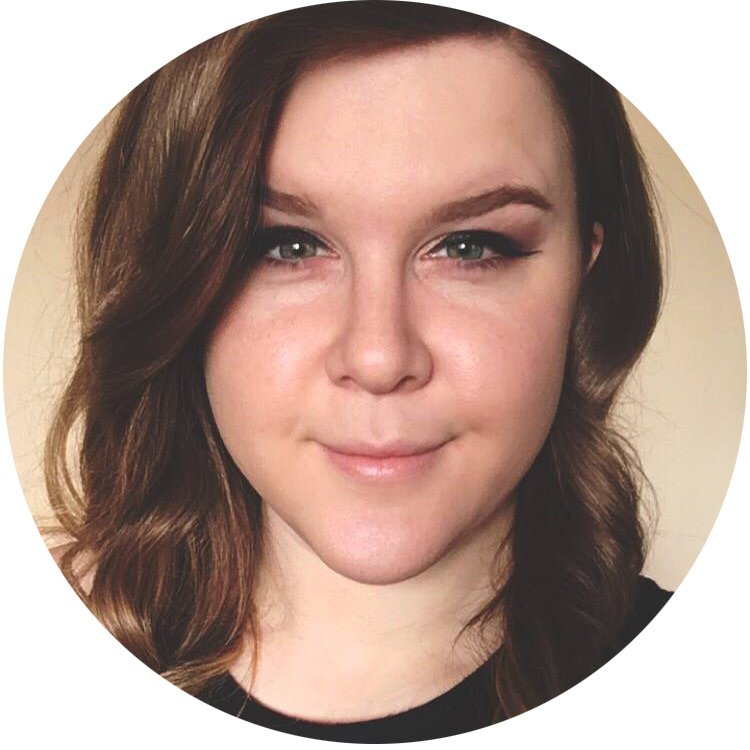 The sheer base would get patchy in spots from all of my glitter pulling, and then some areas appeared lighter than others. This is two coats over Zoya Dove. I had some issues with bubbling on my middle and fourth fingers, because I was using thick coats to try to even out the tinted base. Here I've layered it over some other colors, so you can get the idea of how it tints. From L-R, Slam is layered over nothing, purple, gray, coral. Lacquery Nail Polish is 3-free and is sold in mini bottles for $4 each. I love the glow in the dark glitter! Super cool. What a unique glitter. Nice!! Woahh these are cool! Especially the glow in the dark! That glow in the dark is really neat. It'd be great for parties, especially Halloween. Glow in the dark glitter?!?! OMG MUST HAVE! By black shard-like glitter...you mean black bar glitter in a grey tinted base, right? O.o I don't see anything particularly special about that one T_T the glow in the dark concept is really cool though! The parts in italics are the descriptions provided by the brand. Love the slam polish that is fantastic! And the last one effect is too different. Glow in he dark glitter is absoluely gorgeous!